Positive affect—language revealing that tweeters felt active, engaged, and hopeful—generally rose in the morning, plummeted in the afternoon, and climbed back up again in the early evening. First, our cognitive abilities do not remain static over the course of a day. During the sixteen or so hours we’re awake, they change—often in a regular, foreseeable manner. We are smarter, faster, dimmer, slower, more creative, and less creative in some parts of the day than others. For most of us, those sharp-minded analytic capacities peak in the late morning or around noon. Alertness and energy levels, which climb in the morning and reach their apex around noon, tend to plummet during the afternoons. Much of the research shows morning people to be pleasant, productive folks—“introverted, conscientious, agreeable, persistent, and emotionally stable” women and men who take initiative, suppress ugly impulses, and plan for the future.33 Morning types also tend to be high in positive affect—that is, many are as happy as larks. Owls, meanwhile, display some darker tendencies. They’re more open and extroverted than larks. But they’re also more neurotic—and are often impulsive, sensation-seeking, live-for-the-moment hedonists.35 They’re more likely than larks to use nicotine, alcohol, and caffeine—not to mention marijuana, ecstasy, and cocaine.36 They’re also more prone to addiction, eating disorders, diabetes, depression, and infidelity. Benjamin Franklin had it right: Early to bed and early to rise makes a person healthy, wealthy, and wise. Well, not exactly. When scholars have tested Franklin’s “gnomic wisdom,” they found no “justification for early risers to affect moral superiority.”39 Those nefarious owls actually tend to display greater creativity, show superior working memory, and post higher scores on intelligence tests such as the GMAT. In short, all of us experience the day in three stages—a peak, a trough, and a rebound. And about three-quarters of us (larks and third birds) experience it in that order. But about one in four people, those whose genes or age make them night owls, experience the day in something closer to the reverse order—recovery, trough, peak. 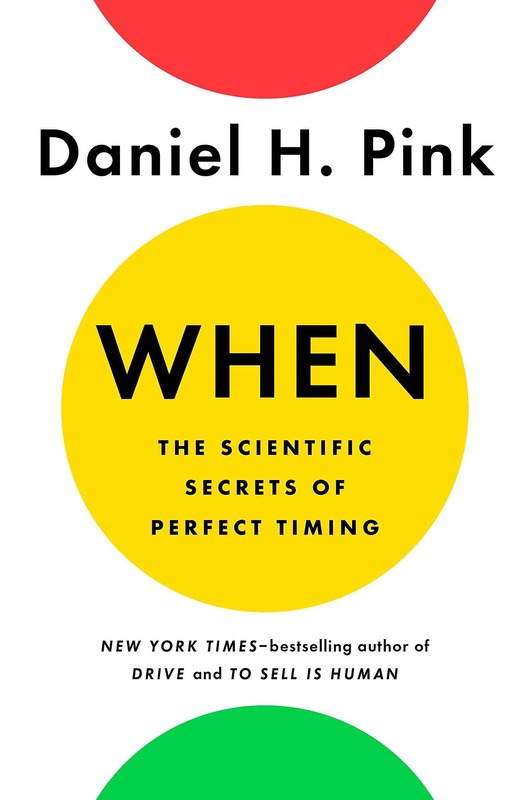 First, determine your chronotype, using the three-question method here or by completing the MCTQ questionnaire online (http://www.danpink.com/MCTQ). Simply knowing that you’re operating at a suboptimal time can be helpful because you can correct for your chronotype in small but powerful ways. Suppose you’re an owl forced to attend an early-morning meeting. Take some preventive measures. The night before, make a list of everything you’ll need for the gathering. Before you sit down at the conference table, go for a quick walk outside—ten minutes or so. Or do a small good deed for a colleague—buy him a coffee or help him carry some boxes—which will boost your mood. Some studies suggest that we’re more likely to adhere to our workout routine when we do it in the morning.2 So if you find yourself struggling to stick with a plan, morning exercise, especially if you enlist a regular partner, can help you form a habit. The moment we awaken, our bodies begin producing cortisol, a stress hormone that kick-starts our groggy souls. But it turns out that caffeine interferes with the production of cortisol—so starting the day immediately with a cup of coffee barely boosts our wakefulness. Worse, early-morning coffee increases our tolerance for caffeine, which means we must gulp ever more to obtain its benefits. The better approach is to drink that first cup an hour or ninety minutes after waking up, once our cortisol production has peaked and the caffeine can do its magic.7 If you’re looking for an afternoon boost, head to the coffee shop between about 2 p.m. and 4 p.m., when cortisol levels dip again. Schedule talk-therapy appointments for the morning. Research in the emerging field of psychoneuroendocrinology has shown that therapy sessions may be most effective in the morning.8 The reason goes back to cortisol. Yes, it’s a stress hormone. But it also enhances learning. During therapy sessions in the morning, when cortisol levels are highest, patients are more focused and absorb advice more deeply. One problem with afternoons is that if we stick with a task too long, we lose sight of the goal we’re trying to achieve, a process known as “habituation.” Short breaks from a task can prevent habituation, help us maintain focus, and reactivate our commitment to a goal.17 And frequent short breaks are more effective than occasional ones.18 DeskTime, a company that makes productivity-tracking software, says that “what the most productive 10% of our users have in common is their ability to take effective breaks.” Specifically, after analyzing its own data, DeskTime claims to have discovered a golden ratio of work and rest. High performers, its research concludes, work for fifty-two minutes and then break for seventeen minutes. One study showed that hourly five-minute walking breaks boosted energy levels, sharpened focus, and “improved mood throughout the day and reduced feelings of fatigue in the late afternoon.” These “microbursts of activity,” as the researchers call them, were also more effective than a single thirty-minute walking break—so much so that the researchers suggest that organizations “introduce physically active breaks during the workday routine.”20 Regular short walking breaks in the workplace also increase motivation and concentration and enhance creativity. Nature breaks may replenish us the most.24 Being close to trees, plants, rivers, and streams is a powerful mental restorative, one whose potency most of us don’t appreciate.25 For example, people who take short walks outdoors return with better moods and greater replenishment than people who walk indoors. What’s more, while people predicted they’d be happier being outside, they underestimated how much happier.26 Taking a few minutes to be in nature is better than spending those minutes in a building. Looking out a window into nature is a better micro-break than looking at a wall or your cubicle. Even taking a break indoors amid plants is better than doing so in a green-free zone. “Lunch breaks,” the researchers say, “offer an important recovery setting to promote occupational health and well-being”—particularly for “employees in cognitively or emotionally demanding jobs.”35 For groups that require high levels of cooperation—say, firefighters—eating together also enhances team performance. caffeine, usually in the form of coffee, followed by a nap of ten to twenty minutes, is the ideal technique for staving off sleepiness and increasing performance. “Graduating from college in a bad economy has a long-run, negative impact on wages,” she writes. The unlucky graduates who’d begun their careers in a sluggish economy earned less straight out of school than the lucky ones like me who’d graduated in robust times—and it often took them two decades to catch up. The best way to earn more is to match your particular skills to an employer’s particular needs. That rarely happens in one’s first job. (My own first job, for instance, turned out to be a disaster.) So people quit jobs and take new ones—often every few years—to get the match right. Indeed, one of the fastest routes to higher pay early in a career is to switch jobs fairly often. If you’re operating in an uncertain environment, not being first can work to your benefit. If you don’t know what the decision-maker expects, letting others proceed could allow the criteria to sharpen into focus both for the selector and you. Ernest Hemingway published fifteen books during his lifetime, and one of his favorite productivity techniques was one I’ve used myself (even to write this book). He often ended a writing session not at the end of a section or paragraph but smack in the middle of a sentence. That sense of incompletion lit a midpoint spark that helped him begin the following day with immediate momentum. One reason the Hemingway technique works is something called the Zeigarnik effect, our tendency to remember unfinished tasks better than finished ones. Mentally subtract positive events. In the mathematics of midlife, sometimes subtraction is more powerful than addition. In 2008 four social psychologists borrowed from the movie It’s a Wonderful Life to suggest a novel technique based on that idea.9 Begin by thinking about something positive in your life—the birth of a child, your marriage, a spectacular career achievement. Then list all the circumstances that made it possible—perhaps a seemingly insignificant decision of where to eat dinner one night or a class you decided to enroll in on a whim or the friend of a friend of a friend who happened to tell you about a job opening. Next, write down all the events, circumstances, and decisions that might never have happened. What if you didn’t go to that party or chose another class or skipped coffee with your cousin? Imagine your life without that chain of events and, more important, without that huge positive in your life. Now return to the present and remind yourself that life did go your way. Consider the happy, beautiful randomness that brought that person or opportunity into your life. Breathe a sigh of relief. Shake your head at your good fortune. Be grateful. Your life may be more wonderful than you think. Write yourself a few paragraphs of self-compassion. We’re often more compassionate toward others than we are toward ourselves. But the science of what’s called “self-compassion” is showing that this bias can harm our well-being and undermine resilience.10 That’s why people who research this topic increasingly recommend practices like the following. Start by identifying something about yourself that fills you with regret, shame, or disappointment. (Maybe you were fired from a job, flunked a class, undermined a relationship, ruined your finances.) Then write down some specifics about how it makes you feel. Then, in two paragraphs, write yourself an e-mail expressing compassion or understanding for this element of your life. Imagine what someone who cares about you might say. He would likely be more forgiving than you. Indeed, University of Texas professor Kristin Neff suggests you write your letter “from the perspective of an unconditionally loving imaginary friend.” But mix understanding with action. Add a few sentences on what changes you can make to your life and how you can improve in the future. A self-compassion letter operates like the converse corollary of the Golden Rule: It offers a way to treat yourself as you would others.